First of all, let me make a comment on the NVIDIA nForce 415-D chipset. There is almost nothing we can add to our review. Theoretically, the north bridge of the nForce 415-D doesn't contain a graphics core, that is why it's called not an IGP(128) - Integrated Graphics Processor but an SPP - System Platform Processor. 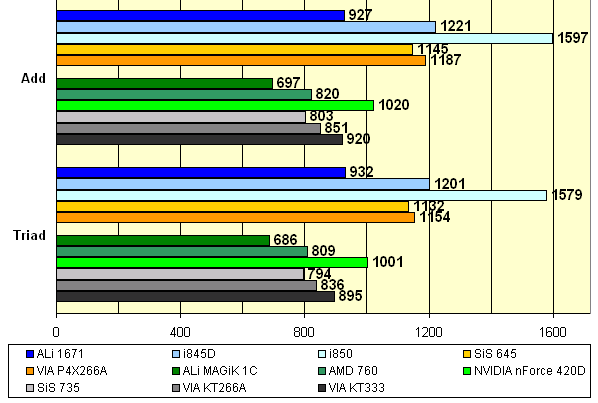 The only architectural difference doesn't provide for a difference between these chipsets in operation with an external video card, and especially in low-level memory tests, that is why the new-comer wasn't tested in the Cachemem and Wstream. 3 - the official south bridge of the chipset is AMD 766, but all actually use VIA 686B. The i850/RDRAM shows the best write speed; it's also a leader in reading. However, all systems for the Pentium 4 platform have excellent results. Among the Athlon-oriented systems we have outsiders - AMD-760 and SiS 735, though the ALi MAGiK 1C doesn't shine either. The nForce outscores all the Athlon systems in the write speed, and the VIA KT333 leads in the read speed. The Pentium 4 team wins at the expense of the Rambus. The i850/RDRAM is a leader again, among the Athlon systems the VIA chipsets (especially KT333) and nForce take turns in leading. And exactly in this test the nForce outdid the rest. I think that the Wstream is not a simple test like the Cachemem, it doesn't just read and write into the memory; it makes some calculations. Maybe the prefetch mechanism turned out to be its ring-buoy. 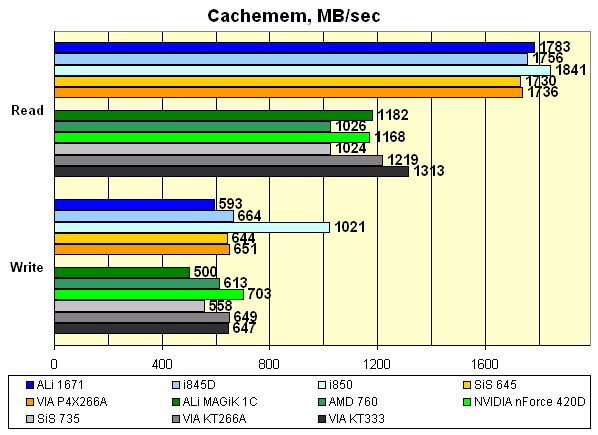 The i845 performs quite good among Pentium 4+DDR systems. 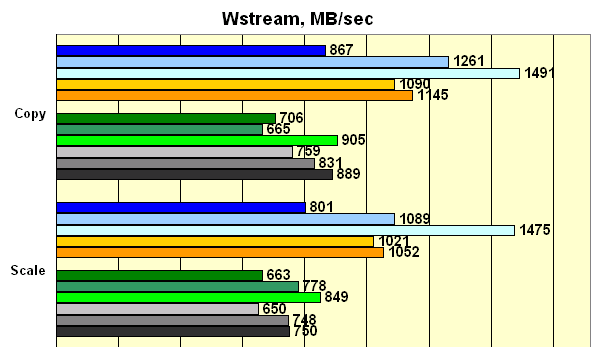 The Prefetch mechanism is vital for the Wstream test, however the Pentium 4 is in better form. The ALi 1671 proves that it is a low-end solution for the high-end processor. It's obvious that all systems on the Intel Pentium 4 work with the memory faster than the AMD Athlon based ones. Well, the Pentium 4's bus has a twice wider bandwidth than the 266 MHz EV-6. Among the P4 systems the leader is the i850/RDRAM.